Global Travel Media » Blog Archive » Sicilia gets new chef and new menu! Sicilia gets new chef and new menu! The Sicilia Italian restaurant in the Mövenpick Hotel Ibn Battuta Gate Dubai, has just received a double whammy bonus, with the arrival of new Chef de Cuisine Raffaele Andreozzi. The 43-year-old Italian national, who hails from the Genoa region of Italy, joins Mövenpick Hotel Ibn Battuta Gate Dubai, following a two-year assignment at the Anantara Desert Island Resort on Sir Bani Yas, in Abu Dhabi. He marked his recent arrival in spectacular fashion by creating two brand new menus – one aimed at busy executives who have limited time for a wholesome lunch and a more extensive and relaxed dinner menu for families and couples enjoying an evening out. At just AED80, the new business lunch menu is proving to be extremely popular, especially with in-house guests and executives working in the local Ibn Battuta Gate offices and Jebal Ali offices. However, when it comes to dinner, Italian culture simply refuses to be rushed, dinner is an important social and family event, not merely an evening meal. 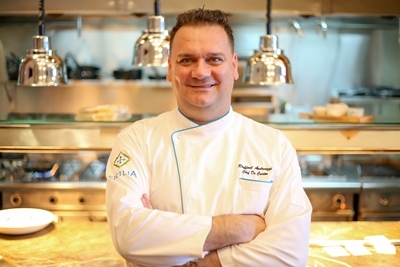 Prior to his time at Anantara, Chef Raffaele started with Princess Cruise Lines as a Demi Chef de Partie in 1998, based out of Los Angeles and quickly rose through the ranks, making Sous Chef by 2006 and Chef de Cuisine in 2012. The following year, he was promoted to Executive Sous Chef for Sabatini’s Kitchen, Crown Grill Kitchen and the main Galley Kitchen. “The theme of our hotel is based on Ibn Battuta’s maritime adventures and Sicilia celebrates his time in the Mediterranean. Chef Raffaele has been raised, surrounded by hearty, nutritious home-cooked food and has spent 18 years at sea, working for Princess Cruise Lines. Given that synergy, it has to be a perfect match,” said Maurice De Rooij, General Manager, Mövenpick Hotel Ibn Battuta Gate, Dubai. During his career which spans 28 years, Chef Raffaele also has extensive experience of working for five-star restaurants in St. Moritz, Paris and Portofino.